HONG KONG -- Prosecutors in Taiwan said they're investigating a man suspected of involvement in illegal oil sales to North Korea. In a statement late Wednesday, prosecutors said they questioned a man surnamed Chen before releasing him on bail of 1.5 million New Taiwan dollars ($51,000) while they continue their investigation. The prosecutor's office in southern Kaohsiung began its investigation after reports last week that South Korean authorities seized a Hong Kong-flagged ship for violating U.N. sanctions by selling oil to North Korea and that a Taiwan company was involved. During questioning, they discovered the man, who owns a fishery company, knew the oil shipment would be sold in international waters but falsely declared its destination as Hong Kong. 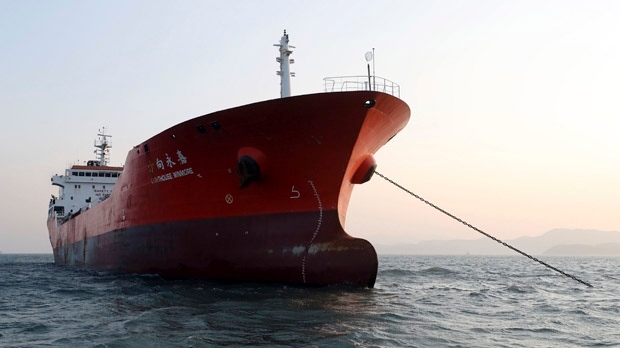 South Korean officials believe the ship, the Lighthouse Winmore, transferred about 600 tons of refined petroleum products to a North Korean vessel, the Sam Jong 2, in the East China Sea in October. South Korea impounded the ship, and a second one registered in Panama days later, after new United Nations Security Council sanctions on North Korea came into effect last month that let member states seize, inspect and freeze vessels suspected of transferring banned goods to the country. Another set of U.N. sanctions adopted in September limits oil imports and includes measures aimed at stopping high-seas smuggling. North Korea has faced increasingly tight sanctions as it steps up efforts to expand its nuclear weapons and ballistic missiles program. In recent months, Pyongyang carried out its most powerful nuclear test to date and flight-tested intercontinental ballistic missiles three times, raising concerns it's closer than ever toward gaining a military arsenal that can viably target the United States. South Korea's Foreign Ministry said this week that a Taiwanese company incorporated in the Marshall Islands chartered the Lighthouse Winmore while a Netherlands-based commodities trader, Trafigura, consigned the oil shipment. Trafigura denied it ordered the shipment, saying in a statement that it sold the cargo on a "free on board" basis to a Hong Kong-based company, Global Commodities Consultants. Global Commodities Consultants said it in turn sold the oil to another company called Oceanic Enterprises on an "arm's length" basis and wasn't involved in any onward sales. The prosecutor's statement said Chen founded a company with a similar name that was now dissolved. Both Trafigura and Global Commodities Consultants said their sales contracts prohibit sales that breach sanctions.